When we started the race in hot, muggy Connecticut, 75 or so cars set out onto the track. 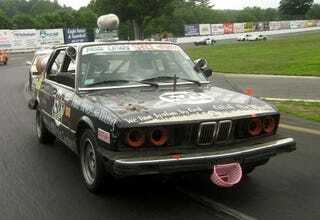 When the race session ended at 10:00, only 35 cars were still running... and a BMW E28 had the lead! The lead switched back and forth between the Near Orbital Space Monkeys 528e and the Team Pro-Crass-Duh-Nation Alfa Romeo Milano all day long, but then the Milano fried a wheel bearing and the BMW ended up with a healthy 7-lap lead. Still, laps are short at this track— say, around 30 seconds for the quickest cars— and a lot can happen on Sunday. I'm too tired to go into much detail here— 95 degree temperature and 100% humidity have a way of making the LeMons Penalty Box an exhausting job— so you'll have to check in tomorrow to get more LeMons action.